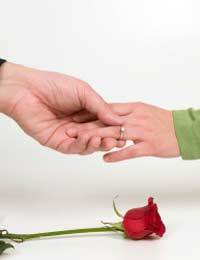 Engagement parties are becoming increasingly popular and many couples choose to have one to share their happy news with friends and family and give them a chance to get to know each other a little before the big day. There’s nowhere near the weight of tradition – or expectation – that surrounds the actual wedding, so whether the party is held in someone’s home with pizza and crisps or takes over a function room and looks more like a rehearsal for the wedding breakfast itself, is really up to you. However, whether it’s formal, informal or somewhere in between one thing’s for sure – you’re going to have to make a speech! Although many people would sooner walk over burning coals than speak in public, your engagement speech doesn’t have to be a terrible ordeal. After all, you are amongst friends, all of whom have come to congratulate you and wish you well, so there’s really no need to worry. Since there aren’t any hard and fast rules over engagement parties, you’re free to structure things in any way you feel appropriate. For instance, one of you can speak for you both, each of you can speak in turn or you can even deliver the speech as a double act, if you like. Whatever seems right for you, just give yourself enough time to prepare what you want to say, follow some of the ideas in the following template and you’ll be fine. It’s always a good idea to start off with a few thanks. Example: Let me start off by thanking you all for coming – it’s great to have so many friends and family to share this with us and I’m really pleased to see Fred and Elizabeth who flew over from Dublin just to be here tonight. Thanks to my big sister too, for letting us take over her house for the night and for putting on such a brilliant buffet for us all. Everyone’s here because of it – so tell them a little about your engagement; aim to keep it brief and the tone fairly light, even if the party is a formal one. Example: I had this really brilliant speech prepared for when I was going to propose – at least it sounded pretty brilliant when I tried it out on the bathroom mirror, most mornings. Truth is, when I actually did manage to pluck up enough courage to ask her, I was so nervous I could hardly speak, so all she really got was a bit more like “er....will you marry me?” It wasn’t the most eloquent of proposals – and I don’t think the squeaky falsetto helped – but it certainly got the answer I was hoping for. Now we’re engaged we (can’t wait to get married / thought we’d enjoy it for a while) and so we’re planning (a wedding as soon as the vicar can fit us in / to get married sometime next year) – so watch this space! Propose a toast; who you toast often depends on who else has spoken and the formality of the evening, but if in doubt, a simple “family and friends” toast is almost always appropriate. Example: Well, that’s enough talking at you – I’d much sooner be talking to you, and I hope we’ll have the chance to catch up with everybody before the night is done. I said it’s great to have everyone here and I meant it – so please enjoy yourselves, but before you do, I’d like to propose a quick “thanks for coming” toast to all of you. We’re both blessed with great families and wonderful friends so, ladies and gentlemen – family and friends! That wasn’t so bad, now was it? All you’ve got to do now is enjoy yourself for the rest of the night – and then start planning that wedding!